In the last post, we created a plugin that calls the command prompt. We can now use this to start writing a plugin that will be a little more useful. But, before we go further, lets look at the three different plugins and what they are used for. The first type of plugin is a MainMenuItem (like the plugin we created earlier). When creating these types of plugins, think big picture. Main Menu plugins have access to things like the pcap file, procmon file, ProcDOTs graph and detail files, and result files. We can pull a lot of data but we wouldn't want to use these if we are trying to do something more granular. The next type of plugin is a ContextMenuItemForGraph. This is where we would want to run a plugin on a smaller data set. These plugins have access to everything listed above and more. These plugins focus heavily on node details in the graph. Lastly, we have EventHandler plugins. To be honest, I have not used these plugins yet. From what I can tell, they appear to wait for an event, like a button push or a click, and act upon that function. When I get time, I'll explore these more and add them to the tutorials. Lets get back to our plugin. Before we go further, you may have noticed that two command windows are spawned when the plugin starts. We can go back to our descriptor file and fix this. If we open our cmd_line.pdp file, there is a keyname called RunHidden. If we change the value to 1, this should fix our problem. With that out of the way, lets move on to bigger and better things. Start up ProcDOT and generate a graph. After the graph is loaded, launch the cmd plugin from the plugin menu. From here, run the command, set | find /i "procdot". We can see in this list all the variables that ProcDOT creates to give us access to the data it sees. We are now going to look at some of these variables and start laying the foundation to write some more useful plugins. So, where do we get the data from to start writing a plugin? We'll now go through these to figure out what everything is. 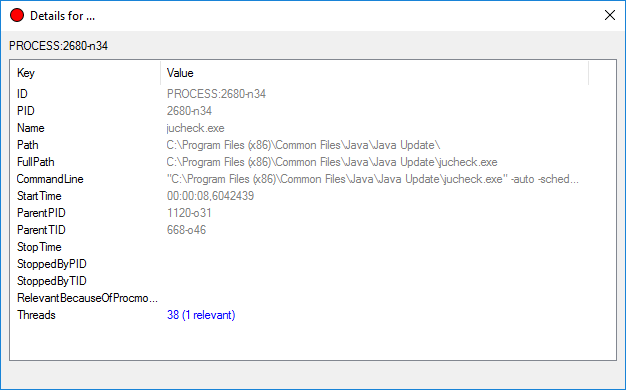 The PROCDOTPLUGIN_WindumpFile, PROCDOTPLUGIN_WindumpFilePcap, and PROCDOTPLUGIN_WindumpFileTxt variables will give us access to the pcap file. The PROCDOTPLUGIN_ProcmonFile, PROCDOTPLUGIN_ProcmonFileCsv, and PROCDOTPLUGIN_ProcmonFilePml will allow us to work with the Procmon file. This is where things start to get interesting. The PROCDOTPLUGIN_GraphFileDetails variable contains the details information. This is the same information in ProcDOT if we were to right click a node and click on details. If we navigate to the file location and open it in a text editor, we will find the same information. The next ones we will look at are PROCDOTPLUGIN_GraphFileDot and PROCDOTPLUGIN_GraphFileDot4Render. 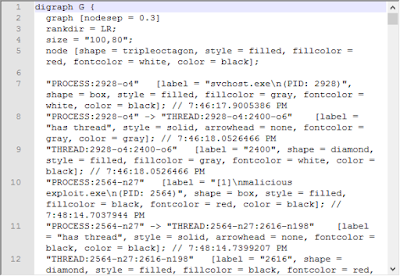 These are the dot files that graphviz uses to render the graphs. From what I can tell, both of these files are the same. The plugin engine is under development so they may be used for different things later on or one of them might get dropped completely. These files contain the information on how everything is related. The PROCDOTPLUGIN_GraphFileTxt variable contains the graph layout generated by graphviz's dot binary. 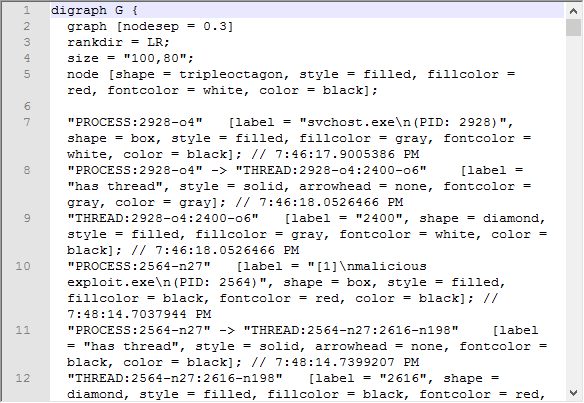 It contains similar information to PROCDOTPLUGIN_GraphFileDot and PROCDOTPLUGIN_GraphFileDot4Render. The last variable for information we are going to look at is PROCDOTPLUGIN_GraphFilePng. This is the graph image in PNG format. According to ProcDOT's documentation, it looks like this variable is going to be depreciated. All this is great but how do we get information out of ProcDOT? ProcDot offers this through its result variable. There are three different types in the current version (looks like a fourth option for image files in the future from the documentation). These variable are PROCDOTPLUGIN_ResultCSV, PROCDOTPLUGIN_ResultTXT, and PROCDOTPLUGIN_ResultXML. You may have guess it by the names, we can get results in xml, csv, and txt. PROCDOTPLUGIN_ResultCSV and PROCDOTPLUGIN_ResultXML are used to make table output complete with styling. PROCDOTPLUGIN_ResultTXT is used for creating plain text results (styling is comming to this in a future release also). I think I will end this post here. There is a lot of information to go over so start digging into some of the files to see what information they contain. In the next post, we will create a plugin that uses some of this information.